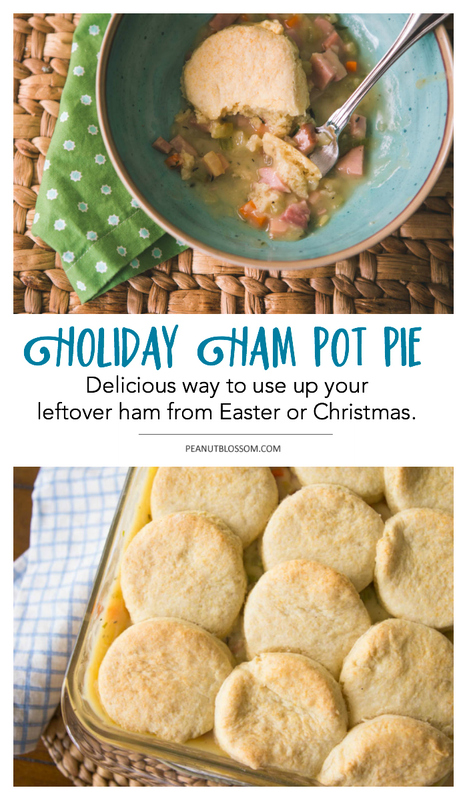 If you need a recipe for ham leftovers, this holiday ham pot pie is the perfect solution. Start with our favorite pineapple and mustard glazed spiral ham for your holiday meal and then use up the leftover ham in this biscuit-topped pot pie recipe. Every Easter we make a giant spiral-cut ham for our holiday dinner. My mom and husband both love to make hot ham sandwiches with the leftover ham the next day. After a lunch or two, we usually still have a giant pile of ham slices that need to be used up! Get our favorite holiday ham recipe here. This recipe calls for making the biscuits for the topping from scratch, but you could really easily substitute a can or two of your favorite refrigerator biscuits to keep it extra easy. 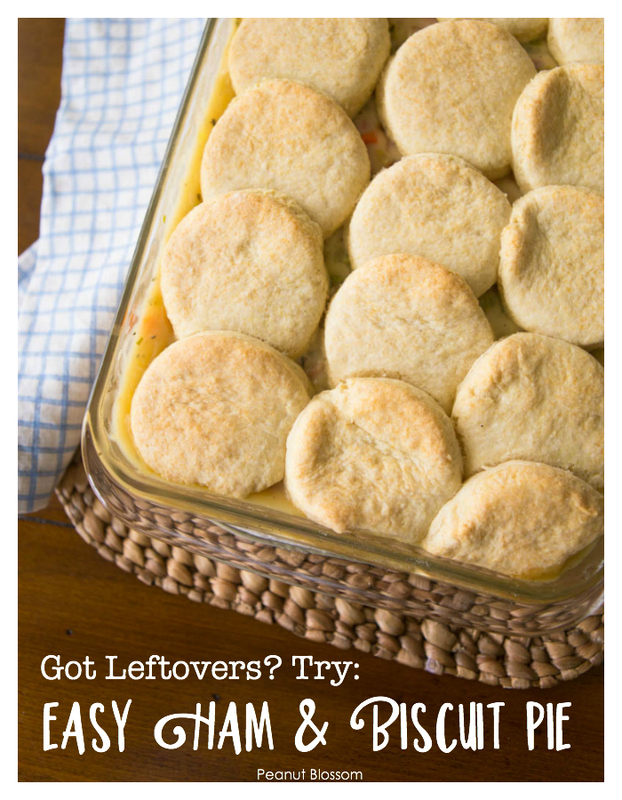 I’ve included directions on how to bake the pot pie with pre-made biscuits if you prefer. There’s one small extra step for this ham pot pie you might be tempted to skip — roasting the veggies before adding them to the filling. If you really don’t want to roast the vegetables, you could sauté them on the stove top until they are softened and the onions are translucent. However, I really do recommend roasting the vegetables because it makes them extra sweet and tender. They can be cooking while you prepare the broth so it really doesn’t add that much time to your work. 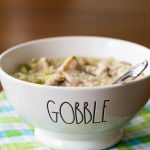 Can you freeze a biscuit and ham pot pie? If you want to use up the leftover ham from Easter before it spoils but are super sick of eating ham right now, you could prepare the filling for the ham pot pie and then just freeze it without the biscuits. Plan to defrost and thoroughly heat the ham filling before you bake it with the biscuit topping when you want to serve it for dinner. 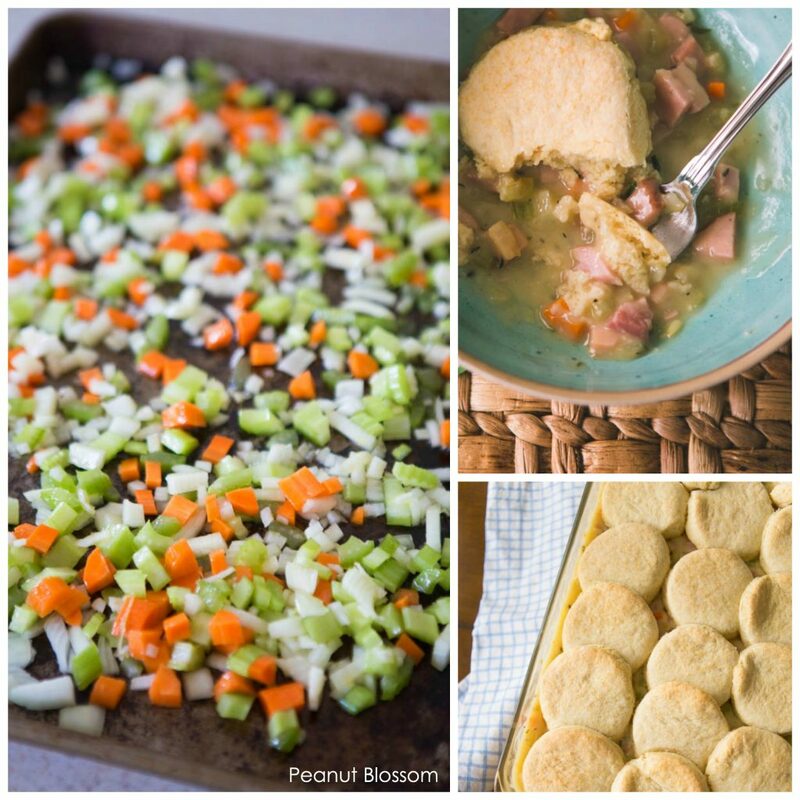 This rich and delicious ham pot pie is topped with crispy, buttery biscuits. It’s the perfect way to use up your leftover ham from Easter or Christmas. Preheat the oven to 425 degrees. Chop the celery, onions, carrots, and fennel and toss them together on a large jelly roll pan. Drizzle the olive oil over the veggies, sprinkle them with salt and pepper, and toss them to coat in the oil. Roast them for 20 -24 minutes until lightly browned. Stir them occasionally to prevent burning. While the veggies are roasting, melt the butter in a large saucepan. Stir in the flour and whisk it into the butter until smooth. Slowly pour in the chicken broth and whisk it into the butter. Add the thyme and bring the broth to a boil. Reduce the heat and let the broth bubble for 10 minutes. Add the roasted veggies, chopped ham, tarragon, and a sprinkle of salt & pepper and stir them to combine with the broth. Pour the filling into a 9 x 13-in baking dish. Add the flour, baking powder, salt, and baking soda to the bowl of a food processor and pulse them together until blended. Add the butter and continue to pulse until the butter becomes the size of peas. Pour the dough into a large bowl and add the buttermilk. Stir until there is no more flour visible. Flour a cutting board and turn the dough out onto the flour. Gently knead the dough 8 – 10 times and then roll it into a 9 x 13-in rectangle. You can cut the biscuits into circles or squares, as you prefer. Arrange the biscuits over the ham mixture making sure to overlap the edges slightly as you go. Bake the pot pie for 25 – 30 minutes or until the biscuits are golden brown. If you use refrigerated biscuit dough: Be sure to heat the ham filling completely through before pouring it into the baking dish. Bake the pot pie for the length of time the biscuits require as directed on the canister they came in. 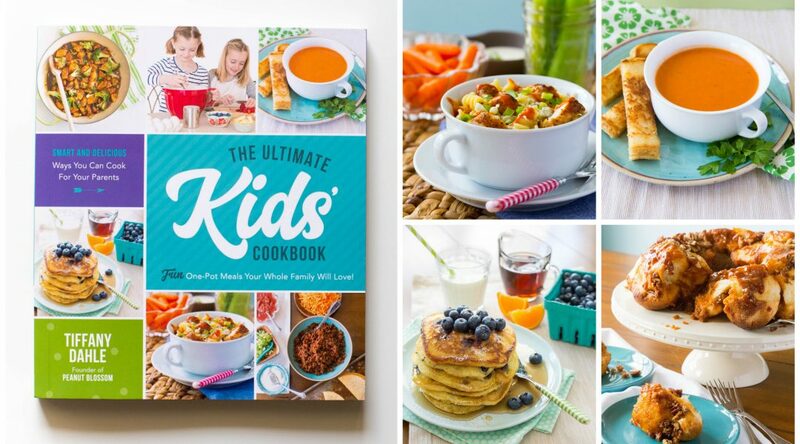 If you love this Easter recipe, you really don’t want to miss these fun spring holiday ideas!